43. What is the significance of ID data type in salesforce? 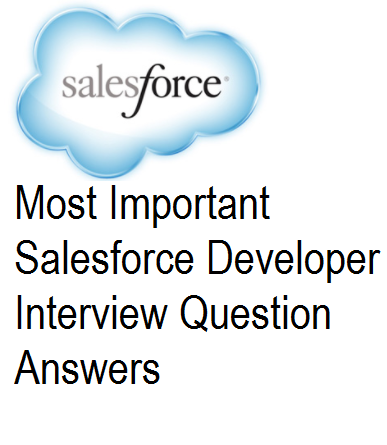 Ans - Every record in salesforce is represented using a parameter called as id. Salesforce uses Data type ID for storing such record id's. An ID is represented in terms of 15 digit or 18 digit. 15 digit id is case sensitive where as 18 digit id is case insensitive. First 3 characters of ID indiacte the object for example 001 means its an account record or 006 means its an opportunity record. 44. What is the difference between a List and Set? List is Ordered where as set is unordered. 45. What are the various primitive data types available in salesforce? 46. What is a map collection? and how is it different from list and set? Ans - A map consists of key and values. Keys are unique while values can be duplicated. Every key points to a value. Using methods we can retrieve the values using the keys or store key-values mappings. map is useful in storing relationships between to parameters. Key is similar to set which can only store primitive types where as values are like set that can also store collections in it. There are number of methods that can be used to manipulate data in map. 47. What is an sObject data type? Ans - sObject is a data type that can store standard or custom object in it. Account for example is a sObject type of data. 48. What is a sandbox.? what are the different types available?